There are some occasions when finding your Uber vehicle can be a bit tricky, especially outside of big events like concerts. But now, the ride-hailing giant is testing a new feature in its cars that will make it a lot easier for Uber customers and drivers to locate each other. On Wednesday, the company announced the launch of SPOT, a system that uses a colored LED light bar installed on a Uber vehicle’s windshield. When a passenger is waiting for their driver, they simply select one of the six available colors from the Uber app (yellow, orange, pink, purple, blue, or green), and once their vehicle arrives its LED will display the customer’s selected color. 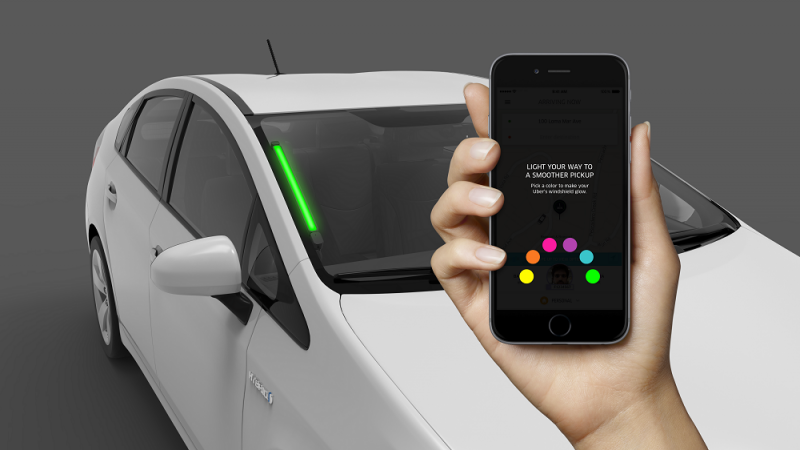 SPOT will also help Uber drivers find their passengers; pressing and holding the chosen color on the app will make the entire phone screen light up that color. The idea is that waving the illuminated phone in the air will make it easier for the driver identify the customer in crowds. Giving Uber drivers and passengers a visual signal so they can recognize each other should help avoid the awkwardness that comes with accidently climbing into the wrong Uber car or a civilian vehicle. The company already provides customers with the license plate number, a picture of the driver, and a photo of the vehicle, but even then the right car can be hard to find in dark, busy areas. “This is simply an attempt to make the experience more seamless and personalized,” Uber Seattle GM Brooke Steger told GeekWire. It’s also hoped that by making it easier for passengers and drivers to find each other, waiting times for Uber vehicles will be reduced. The feature is being rolled out for initial testing in Seattle later this month. If it proves successful, expect it to expand to other areas.